I considered myself something of a DJ in college, though two turntables and an MPC1000 drum machine didn’t make my beats any good. Thanks to Apple Inc.AAPL +5.05%’s updated GarageBand app for iOS released this week, I’m confident enough to upload newly crafted tracks for the world to hear. GarageBand received its biggest refresh since the software first landed in 2011. Among the changes is a new feature called Live Loops that lets even novice creators effortlessly arrange snippets of sound called “loops” into a coherent song. Live Loops are stitched together using a grid layout that is easy to grasp and well-suited for touchscreens. This new design made all the difference. Apple touts GarageBand as music-making for the masses. The rapper T-Pain, known for distorting his vocals through an electric sound called Auto-Tune, famously recorded his entire first album in GarageBand. Until this latest release, though, I’ve found the software frustrating, like seeing a studio soundboard for the first time and not knowing which knob to turn. The new GarageBand is much easier to grasp. Instead of trying to fill a forbiddingly empty timeline with sounds from instruments, Live Loops lets me tap around a grid of open “cells” waiting to be filled them with loops. Each grid has 32 different rows with 15 cells apiece, mimicking the drum machines I’ve used in the past. The cells don’t all need to be filled — a song can be as complicated or as simple as desired. I can create the end of a track first with no trouble, and no matter where the loops are placed, GarageBand turns them into real music. That let’s me focus on finding the right pair of sounds rather than what order they are in on a timeline. It’s simple to mix and match loops — there are more than 1,200 of them — to find the sound I like. An “FX” button in the upper-left corner of the app allows for tweaking the sound effect of each loop, perhaps by using a reverb filter to add a bit of echo. There are nine Live Loops templates built into the app for people who don’t want to start with an empty grid. There’s a template for almost every major genre of sound, including Hip-Hop, Rock, R&B, Electronic Dance Music and Dubstep. Once inside a a template, tapping on any of the prefilled cells plays back the song. Loops can be removed or rearranged by tapping an edit icon in the lower-left corner. No matter what changes are made, GarageBand keeps the sound synced so it is never off beat. 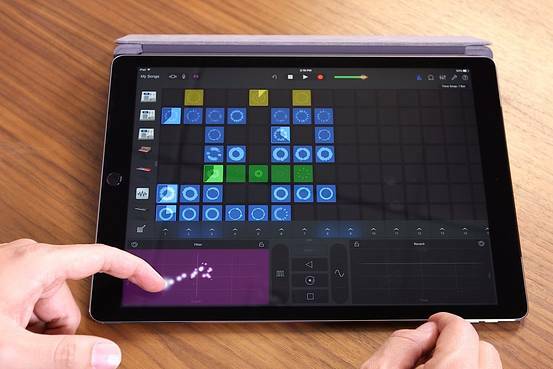 There are dozens of pricey iPhone and iPad apps that offer a few of the features found in the updated GarageBand. Tabletop, for example, lets you build a virtual collection of keyboards and drum machines. 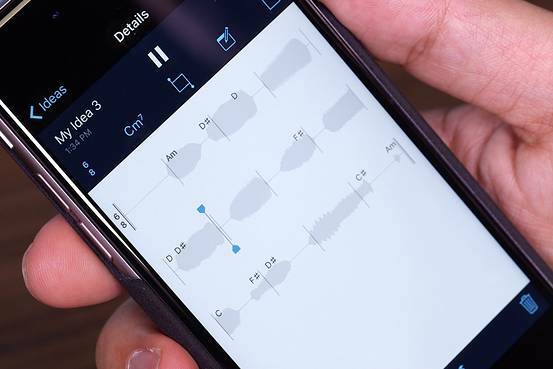 Korg’s apps recreate its legendary synthesizers. If you haven’t used a drum machine or a keyboard before, it’s tough to understand where to start with many of these rivals. About 20 minutes into tapping around in Live Loops, I had the basics down. After years of struggling with music-making apps and giving up, I was surprised to find myself having fun. A week later, I’m still at it making music I want to share. A new GarageBand wasn’t Apple’s only release this week. The company also created a new free app called Music Memos for musicians who play real instruments and want to capture an idea on the go. Many had been using the Voice Memos app to record music, Apple says, so it built Music Memos in response. Music Memos has a one-button interface to start recording, and it is smart enough to recognize notes, bars and tempos in real time. Anything recorded in the app can be pulled into GarageBand, and then combined with virtual drums or some other Live Loop accoutrements. The updated GarageBand comes preinstalled on iPhones and iPads that have 32 gigabytes or more of storage. The Live Loops update is free to those who already have GarageBand installed. For those who don’t, Apple sells the app for $4.99.